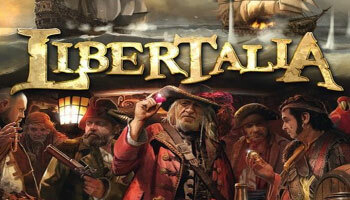 Libertalia is the name of a utopian pirate colony where retired pirates can enjoy without fear of being lynched. 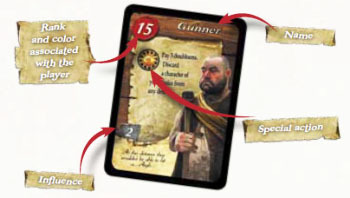 The game is a competitive card game over 3 six-day campaigns where players try to amass riches by looting ships. The cards in your hand are representing cremates on your ship. They help you to aquire the available booty. It's your goal to become as rich as possible by collecting the highest value booty tokens, but watch out and don't collect cursed tokens. You have to out-think your opponents and good hand management and strategy are the key in this Libertalia. Will you play your higher ranking pirates to get that treasure chest or will you compete for the sword to kill one of your enemies? The player who has collected the most money on the end of the game is the winner and can retire on the pirate paradise Libertalia. The players take on the role of crew members of a pirate ship nearing retirement. During the 3 campaigns which compose the game, they will try to amass riches by looting ships. These cards are central to the game. They represent the various members of the player's crew as well as important individuals who remain on land. Not all of them have the same influence or the same importance. Moreover, each of them has a special ability which will have to be used during the game.